Doug Bauder, director of the Gay, Lesbian, Bisexual, Transgender Student Support Services Office, said he was surprised to find himself among IU’s chosen Indiana Bicentennial torchbearers. “When I got the letter, I honestly had to laugh a little,” Bauder said. The torch came through campus Tuesday afternoon as part the statewide relay to celebrate Indiana’s 200th anniversary of statehood. Between Sept. 9 and Oct. 15, the torch will reach all 92 counties in Indianaand be passed between citizens who have made significant contributions to their county and the state. In addition to Bauder, the torch was also carried by IU Board of Trustees secretary Debbie Lemon; Department of Theatre, Drama & Contemporary Dance professor George Pinney; alumnus writer and producer for “Hoosiers” and “Rudy” Angelo Pizzo; Jacobs School of Music senior lecturer Sylvia McNair; and Assistant Vice President for Strategic Partnerships Kirk White. Bauder said he is honored to be part of the day alongside other great torchbearers, although he finds his participation in the state event funny when Indiana’s government has been known to pass anti-LGBT legislation like the Religious Freedom Restoration Act. He doesn’t know what Gov. Mike Pence would think of the situation, he said. 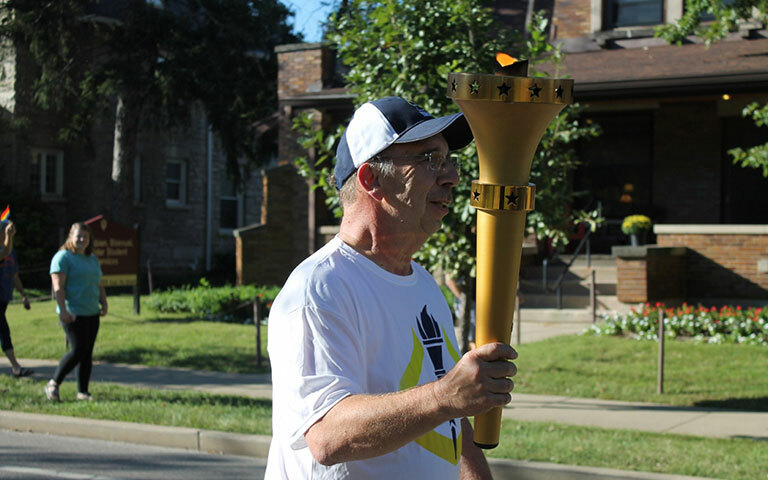 As a gay man, Bauder said carrying the torch is symbolic for him as well as for the rest of Indiana’s LGBT population. He said he is glad to represent Monroe County and Indiana communities. For Bauder, the honor shows just how far the state has come in recent years. In the past, LGBT support was much more difficult. He said the state legislation was originally against the GLBT office proposal in 1994. At the time, it threatened to withhold about half a million dollars of public funding from the University if the office were created. With the support from then-president Myles Brand, funding of the organization was privatized, and the GLBT office opened. Now, through support for national marriage equality and opposition to the RFRA, Bauder said he sees how far progress has come. “I’m representing a group of citizens that don’t get recognized, and they’re a part of history,” Bauder said. GLBT office graduate assistant Danielle Hernandez said she doesn’t see why Bauder was surprised to be nominated because he is an important part of the campus community. Dondeerie Dumayas, a member of IU’s GradQueers organization, said he agrees. Hernandez said she believes the representation comes at an important time for the LGBT community in Indiana. “It makes our office proud to be recognized as a part of the community as well as the state,” Hernandez said. For Dumayas, the significance is about all the progress he said he’s seen through equal marriage and open military policies. “The community’s here to stay, and we’re going to fight for the community to ensure fair and equal rights for the state of Indiana,” Dumayas said.